Internal Oscillator -plus 3 Xtal Modes up to 20 MHz. The 16F88 has two 14-bit configuration registers at memory locations 2007H and 2008H. 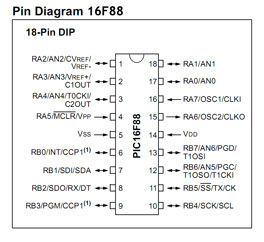 The bits in the PIC's configuration register enable or disable features in the microcontroller. Features such as Code Protection, Watchdog timer, Oscillator, etc. Using PBP compiler and MicroCode Studio IDE allows you to set the configuration switches inside the program. We only need to set a few bit registers and leave the rest at their default status. Add the following three lines to the top of your program to set the configuration switches. These settings are applicatable for most of our programming needs at this moment. 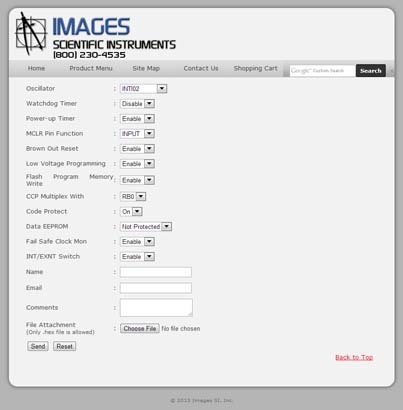 Below is a screen images of Images SI Inc.'s 16F88 hex file uploader programmer's page. This page is for users who have written a PBP program, compiled the PBP program into a hex file, and want the hex file program (firmware) uploaded into a 16F88 PIC microcontroller. Most PBP programmers own a programmer to do this. But for novices starting out, this service allows them to get their firmware uploaded into the microcontroller without purchasing a programmer. Here we can see all the possible configuration set-ups available.